After years of planning her fertility journey as a single mom, Heather Bowman was thrilled to learn that she was expecting twins, but she was also scared. Her twin pregnancy came after multiple pregnancy losses, including a previous twin pregnancy, and a diagnosis of unicornuate uterus, a rare uterus malformation. So when Bowman's doctors couldn't find a heartbeat for one of the babies at her 17-week ultrasound, Bowman was devastated. Her son's heart was no longer beating, but his sister's was, and so Bowman rallied herself for the rest of the pregnancy. When her daughter Leti was born, Bowman opened up about her losses to photographer Jessica Young, who had been recommended by a friend. 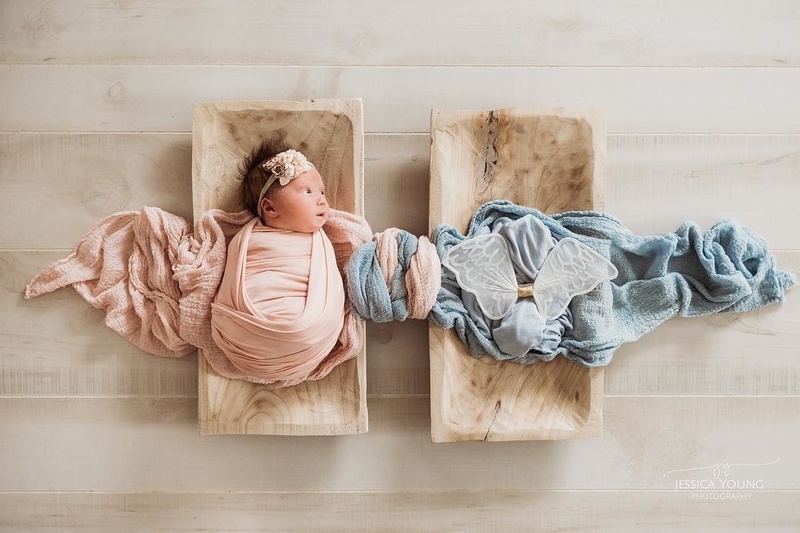 Young came up with an idea for Leti's newborn photo shoot that honors her brother James' place in her journey. When Bowman arrived and saw what Young had planned for the shoot, she "lost it," she tells Motherly. "All Leti could do was look over to where her brother would have been, and I couldn't help but feel he was lying there, letting her know he was there and that he is always with her," says Bowman.